Bad news: reservations must be cancelled 14 days prior to arrival to avoid a two-night penalty fee. Mauna Lani Resort’s two championship golf courses, the North and the South, have received Golf magazine's Gold Medal Award every year since 1988. Minimum three night stay, per room, per night, single/double occupancy. More here about golf on the Kohala Coast. Stay tuned here for news and vacation packages at Kohala Coast Resorts. 5-diamond-rated Four Seasons Resort Hualalai on the Big Island of Hawaii is extending their popular $1,000 resort credit through June 20, 2010. The $1,000 credit is awarded for every six nights booked, and you get a $2,000 resort credit when you stay in a 2-bedroom suite for every six nights booked. Credit can be applied to various resort experiences, from golf and spa treatments to a class at the Cultural Center and restaurants. Read here about the recent $40 expansion at Hualalai, which included new suites, a major spa enhancement, an oceanfront pool deck, new retail shops and a beachfront bar, lounge and restaurant. Read about Tom Watson's recent win at Hualalai. 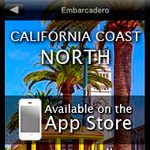 Founder/editor of BestGolfResortsofTheWorld, Karen Misuraca is a travel and golf writer from the California Wine Country. She follows the little white ball around the world and blogs about International Golf Travel at www.examiner.com. And, she also writes a blog on Sustainable Travel. 18 of the 27 holes on the stunning, seaside Makai Golf Course at new St. Regis Princeville Resort on the island of Kauai have been under complete renovation for months, with reopening set for next week. The changes and upgrades were designed by the original architect, Robert Trent Jones Jr., who has a vacation home nearby. Highlights of the course renovation include the installation of Seashore Paspalum turf on tees, fairways and greens--an eco-friendly, salt- and drought-tolerant turf variety. The course was lengthened, new bunkers were added and existing traps were reshaped and refilled, and the practice area was expanded. The Makai's "big brother" is the Prince Golf Course, a spectacular layout 300 feet above the ocean, ranked among "America's 100 Greatest Golf Courses", with a 75.3/145 rating and slope. If you haven't played at Waikoloa Beach Resort on the Kohala Coast of the Big Island of Hawaii lately, it's time to return. Recent changes on the Kings and Beach courses have raised the bar for all of the resort courses on the coastline. All of the holes on the Beach Course have been renumbered (i.e., the 6th is now the 1st, making for an over-water start), and bunkers have been deepened and filled with beautiful new sand from Australia. And, the greens have been subtly transformed from the previous bumbly-ness into perfectly even, true rolling condition. The par-70, 6,566-yard, RTJones, Jr.-designed Beach Course is menaced by dramatic black lava fingers and outcroppings, although generally wide fairways make it possible to proceed without too many disasters. Golfers on the back tees face water carries on four of the first seven holes. Haul out your camera on 12, where the iconic oceanfront panorama is fringed with a parade of waving palms. The Waikoloa Kings' Course bunkers and Bermuda greens were also significantly upgraded. This 7,074-yard track is a Weiskopf & Morrish-designed, link-style beauty where the approach shot is of ultimate importance. Pot bunkers, six lakes, shifting winds off the ocean and a 73.4/135 rating/slope from the back tees make the Kings' a daunting challenge (four tees allow the average golfer to enjoy the round, starting from the 5,459-yard forward tees). Not enough golf in the daytime? "Glow Golf" is a popular after-dark activity on the 18-hole seaside putting course, complete with sand traps. water features and fluorescent balls. One of the best choices for stay-and-play at Waikoloa Beach Resort is Hilton Waikoloa Village, a sprawling, flamboyant and multi-faceted complex. Fresh from a recent $10 makeover, the resort is graced by a veritable botanical garden of riotously blooming flora in a water wonderland of lagoons, ponds, waterfalls, grottos and canals, all a-twitter with tropical birds. Besides 9 restaurants, many shops, and swimming pool extravaganzas, the Hilton has numerous hideaways waiting to be discovered, from the loungy sofas on the Kamuela Provisions Company terrace, overlooking a rushing waterfall and the ocean, to a labyrinth of meandering walking paths crossing under a waterfall, over bridges, past the dolphin lake and through quiet Japanese-style gardens. The spectacular "Legend of the Pacific" luau under the stars is a must-see. Most rooms have ocean views, in fact it's practically impossible to be out of sight and sound of the sea here. My favorite place for lunch or dinner is the Provision Company ocean-front terrace, just above the crashing surf. There is a vast, sand-edged, calm lagoon for ocean swimming, with paddleboats, snorkeling and stand-up paddle boards. And, don't miss the dolphins. You can either sign up for a thrilling Dolphin Quest encounter, or just wander by the dolphin lake any time, to watch their 24/7 antics. 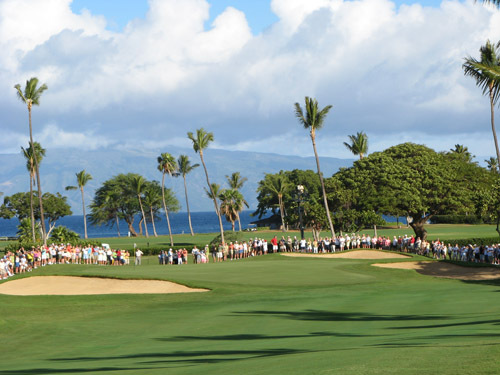 More about golf on the Kohala Coast. Resort hotels, condos, restaurants and activities on the Kohala Coast at www.kohalacoastresorts.com (with tips and resources regarding weddings, meetings, spas and special packages). On the 20-mile stretch of the Big Island’s Kohala Coast, nearly a dozen luxury resorts are heralding the 50th anniversary of statehood with great packages, good through the end of this year. "50 Years of Aloha" at Hilton Waikoloa Village: stay 5 nights and receive the 5th night at $50; plus a $50 resort credit for spa, dining or beach craft rentals, and more. Through December 20, 2009. (In addition, guests turning 50 in 2009 will receive a complimentary entrée at select restaurants.) One of the largest resorts in the islands, the 1,240-room Hilton (within Waikoloa Beach Resort) has a 4-acre, ocean-fed lagoon and pure white sand beach. Among activities are the Dolphin Quest; spectacular dinner show and luau, 8 restaurants; waterslides and waterfalls, the Beach and the King golf courses, and a meandering canal where guests ride in small boats, among other attractions. The Waikoloa Beach Marriott Resort & Spa is offering the "Celebrate Hawaii Turning Five-O with Our Statehood Package" that includes 4th night free, room upgrade, $50 resort credit, daily breakfast, special gift and more (through December 24, 2009, rates from $385.). The 5-star-rated Fairmont Orchid's "Hawaii 50% Off Sale" is a 50% discount off published room rates for new bookings; from $225, through December 20, 2009. Notable at the Fairmont is the gorgeous Spa Without Walls with waterfall massage hale (huts) and oceanfront massage cabanas. Tennis fans head for The Vic Braden Tennis College and the 10 plexipave courts. One of my favorite resorts on the planet, Four Seasons Hualalai gives you a $1,000 resort credit for staying 4 consecutive nights--at this uber-upscale oasis, this is a fabulous deal! (through November 19, and Dec 5 - Dec 17, 2009). Don't miss the Jack Nicklaus signature Hualalai Golf Course. Long the standard for low-key atmosphere, tropical elegance and top notch personal service, and the award-winning North and South golf courses, the Mauna Lani Hotel & Bungalows is offering the Hawaii 5-O Anniversary Special, with dates available through December 23 (so far--book soon). Get the latest news about Kohala Coast resorts special packages and events at www.KohalaCoastResorts.com. More about golf resorts in Hawaii. 5-diamond-rated Four Seasons Resort Hualalai on the island of Hawaii has completed a $40 million expansion that includes 20 new suites, a major spa enhancement, an oceanfront pool deck, new retail shops and a beachfront bar, lounge and restaurant. Comprising between 1,150 and 1,950 square feet of indoor/outdoor living space, the new 1- and 2-bedroom suites have spectacular ocean views; all of the suites have living rooms, luxurious bathrooms with steam showers, and lanais with 180-degree views of the Pacific Ocean. Newly expanded to 28,000 square feet, the Hualalai Spa welcomes guests into open-air tropical gardens and dark, cool interior spaces. Before treatments, guests can enjoy complimentary neck and shoulder massages while trailing their toes in the stream that trickles through the tranquil Waiea garden. Native plants and minerals known for their healing qualities are incorporated into signature treatments. More on the new Huaualai Spa. Adjacent to spa, the new Seaside Boutique features such designers such as Allegra Hicks, Tory Burch and von Furstenberg, and glam resort wear––cashmere wraps, Kotur clutches, St. Tropez sandals. The resort's beachfront restaurant, bar and lounge, the Beach Tree, has reopened with a transformed interior and exterior, a new menu and chef, and zowie ocean views. Awnings, a thatched roof crafted from local trees, and overstuffed sofas and chairs contribute to the “Hawaiian beach house” feel, encouraging long lunches, romantic dinners and cocktail hours. The Jack Nicklaus signature Hualalai Golf Course is one of the most challenging and spectacular oceanfront layouts in the islands. Waterfalls rush down the steep mountainsides on the north coast of Kauai, the Garden Island. Princeville Resort sprawls on a terraced cliff above Hanalei Bay, below the spectacular peak of Bali Hai. The film, "South Pacific", was shot in this gorgeous setting of velvet green mountains and sugar-white beaches. Integrated into a rainforest on rolling tableland and along the oceanfront is the Prince Course, designed by Robert Trent Jones, Jr. The course is all is waterfalls and streams, jungly ravines and thousands of trees and blooming shrubs––paradise with a formidable 75.3/145 rating and slope, earned by forced carries, stiff tradewinds and a clever dearth of bailout areas. Fairways careen downhill and over gorges, as on the 7th, which reminds golfers of the famous 16th at Cypress Point. With the Pacific all along the left, a 180-yard carry against the wind heads toward waves breaking on the reef off Anini Beach. Behind the green on the thirteenth, a waterfall cascades from a lava tube set in the middle of a cliff festooned with ferns and flowers, then drops into Anini Stream, which wanders around the green and dissects the fairway landing zone, 200 yards from the back tees. Whew! Princeville’s "2009 Tease for Two Package" offers a round of golf on the Prince Course and a 50-minute massage at the Princeville Spa for $275 (through 2009). More news at Princeville: Makai Course will unveil a substantial renovation to all 27 holes on Nov. 1. The Grand Hyatt Kaua‘i Resort & Spa on Kauai was rated No. 16 in GolfWorld magazine’s “2009 America’s Top 50 Resort Courses.” The resort is offering a summer fifth-night free promotion that includes daily breakfast for two adults and up to four children, 50% off a second room for children, "bottomless cup" for children 12 and under, 1/2 camp for one child, one free in-room movie and a 20% discount at the opulent Anara Spa. Puakea Golf Course in Lihue is family and child friendly, too, allowing kids to play free all summer long (ages 7-18), one free junior for each paying adult (through August 31, 2009). This course was rated 13th best in Hawaii by Golfweek Magazine. Also in Lihue, the Jack Nicklaus-designed Kaua‘i Lagoons Golf Club is offering $85 green fees and $25 club rental this summer, including two sleeves of premium golf balls (available after 11 am daily). Children ages 6-17 play free with free club rental when accompanied by a paying adult anytime. (both special valid through August 31) This course was voted one of the “Top 50 Resort Courses” worldwide by GolfWorld in its “2009 Readers’ Choice Awards”. Kauai Lagoons is adjacent to the Kauai Marriott Resort & Beach Club. Green fees for non-resort guests are normally up to $175 and club rentals at $55, so these summer specials mean substantial savings. Soon to open, the new addition to the spa at the Four Seasons Hualalai at Historic Kaupulehu, the Waiea Garden (Water of Life) will be an enclosed tropical garden with a waterfall that flows into a pond and stream. Guests will retreat to this lush, secluded environment to cool their tootsies and have hand-and-foot massage and back-shoulder massage--or, just enjoy the greenery while waiting for spa treatments. Several private "hales" (cabanas) are under construction in the spa garden, too. To enhance and personalize the array of exotic and traditional body/beauty treatments, a unique apothecary is the guest's first stop, where they choose from a fragrant inventory of local ingredients that have been grown and harvested locally--such as awapuhi(ginger), coconut, kukui nut oil, honey, sea salt and more. Custom-created mixtures are then used in the scrubs, wraps and massages, and guests are able to take home a supply of their special concoctions. Within the Hualalai Spa is a full-service salon, indoor and outdoor showers, steam, sauna, and a big lap pool is right outside, along with separate fitness and aerobic venues, yoga and pilates rooms, the tennis center, and a convenient coffee garden where guests gather for snacks and drinks throughout the day. For guests who cannot bear to leave the oceanfront pools or their 5-star-rated rooms and suites spa treatments can be arranged at poolside cabanas and on the private balconies, and patios of guest accommodations--aaahh. On the Kohala Coast of the Big Island of Hawaii, the Four Seasons Hualalai is comprised of a scattering of low-rise buildings amid a blooming jungle of gardens and trees, all within the sight and sound of the ocean. On the menu of activities are golf on the spectacular Jack Nicklaus Signature Hualalai Golf Course, paddle-boarding and outrigger canoeing, tennis, "Kids for All Seasons," a cultural center, shopping, and just relaxing on the beach. Check out the Kauai section of my series on "Best Resort Golf Courses in Hawaii" on examiner.com! Home of the Arnold Palmer and the George Fazio courses, Turtle Bay Resort & Spa on the North Shore of Oahu is offering the Daily Unlimited Golf Challenge, including a day of unlimited golf with cart per guest; and for non-golfers an $80 credit per day to use at the spa, horseback riding, helicopter tours, kayaking, etc. 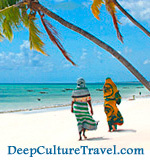 (from $287 per night for Ocean Front accommodations, through December 21, 2009). Away from the hubbub of Honolulu, about 45 minutes from the airport, on a spectacular headland surrounded by two beaches, Turtle Bay is isolated, yet nearby the quiet pleasures of the North Shore. The resort is comprised of 375 guest rooms, 26 suites and 42 luxury beach cottages and villas, tennis courts, and hiking and horseback riding trails in the hills. Even closer to the airport (17 miles), Ko Olina Golf Club hosts the LPGA Fields Open in February. Generous fairways are kind to resort players, while elevated, undulating greens and acres of translucent lagoons, ponds, lakes and cascades, plus a scattering of pot bunkers, raise the excitement level, between the waving coconut palms and the overhanging banyan, plumeria and monkeypod trees. Across the road from the golf course, perched on the beautiful, sand-fringed bays of Ko Olina Marina, JW Marriott's Ihilani Resort & Spa has more than 400 rooms and suites for guests who spend their days snorkeling, swimming, kayaking and sailing in the calm bays. The resort's Escape! Golf in O'ahu package includes 2 nights in an ocean view room, 2 rounds of golf per day and 2 sleeves of golf balls(from $648 through December 18, 2009). 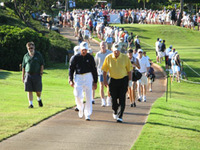 Read more about golf resorts in Hawaii at examiner.com (I'm the new Resorts & Spa Columnist). Home of the Champions Tour Mitsubishi Championship, the 7,100 yard Nicklaus Signature course at Hualalai on the Big Island of Hawaii meanders dramatically through lava fields and tropical greenery to finish in spectacular holes along the sea. Residents and guests at the Four Seasons Resort Hualalai at Historic Ka'upulehu can take advantage of the Unlimited Golf Package, which includes unlimited daily golf and driving range access per night stay, including shared cart and breakfast for two, from $980 per room, per night, August 25-November 20, 2008, and December 1 - 18, 2008; and $1,060 per room, per night now through August 24, 2008, and November 21 - 30, 2008. Zagat and Travel + Leisure say that Hualalai is the #1 resort in the islands. Through mid-December, guests at Mauna Lani Resort will have the rare opportunity to play the "Classic Course" at the resort, which is comprised of 9 holes on the South Course and 9 Holes on the North Course. Especially for guests who stay at the 5-star luxury resort for several days, golf on the North, the South and the Classic will make for a vacation of a lifetime. The North and South courses are laid amid rugged, dramatic lava formations along the Kohala Coast of the Big Island of Hawai'i. The resort is racking up awards this year: #8 of Travel & Leisure's World's Best; #1 spa in Hawaii from Conde Nast Traveler; one of 10 top Environmentally Friendly Golf Courses from Golf Magazine; one of “World’s Top 3 EarthFriendly Getaways from Conde Nast––the accolades go on. Mauna Lani has been one of Golf magazine's Gold Medal-rated resorts since 1988. New in recent years is the Keiki Golf Course, designed for beginners and for junior golfers and children 18 years and younger. The only course of its kind in Hawaii, the Keiki is perfect for kids who are learning the game yet are not ready to play the championship courses.